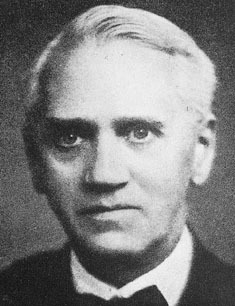 Serving in the Royal Army Medical Corps during World War I, Scottish bacteriologist Alexander Fleming was troubled by his inability to care for infections in deep wounds, where bacteria could thrive beyond the reach of the era's antiseptics. After the war he began searching for a better antibacterial agent, and in 1921 he made a significant breakthrough with the discovery of lysozyme, so named because it lyses (dissolves) microbes. Lysozyme occurs in white blood cells, egg whites, milk, pus, saliva, and tears, and engulfs and digests bacteria, forming a key component in the body's defense system. Though this alone would be enough to secure Fleming's place in medical history, he is far more famous for his second significant breakthrough in September 1928 — the accidental discovery of penicillin. Growing bacteria cultures for experiments he hoped would lead to a flu vaccine, Fleming mistakenly left several petri dishes uncovered for several days, and mold began growing, ruining his experiment. He noticed that the bacteria nearest the growing mold had been destroyed. He incorrectly classified the mold as being of the species Penicillium rubrum, but correctly noted that the presence of the mold prevented growth of Staphylococcus aureus, a parasitic bacteria that can cause a wide variety of infections. Originally calling his discovery "mold juice", Fleming renamed it "penicillin" for the paper he wrote, which was published in the British Journal of Experimental Pathology, but neither he nor the readers of his work seemed to have seriously understood the discovery's implications. Eleven years later two Oxford researchers, Ernst B. Chain and Howard Florey, read Fleming's paper and re-opened his line of inquiry, ascertaining that the mold was P. notatum, not P. rubrum, and isolating, purifying, and synthesizing the drug. The first naturally-occurring antibiotic to be discovered, penicillin gave humanity the first effective treatments for diphtheria, gonorrhea, pneumonia, scarlet fever, syphilis, and other diseases, saved countless millions of lives, and led to shared Nobel Prizes for Medicine in 1945 for Chain, Florey, and Fleming.